AVAILABILITY: In Stock: Free FedEx Same Business Day Shipping. Faster Shipping Can Be Selected During Checkout. 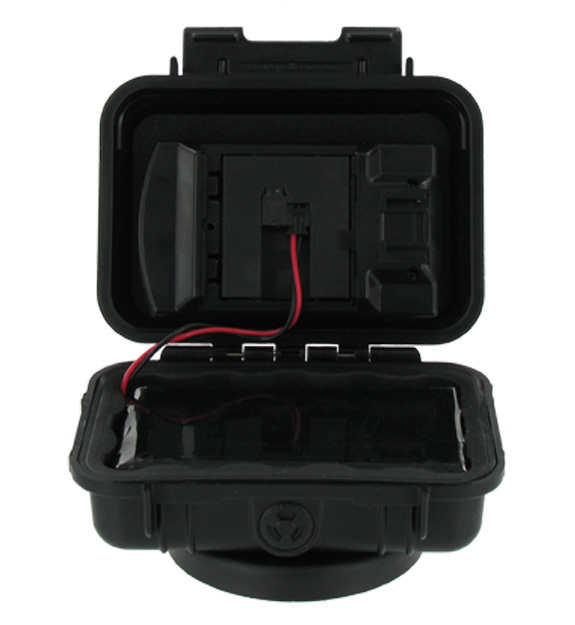 Phenomenal Live GPS Tracker with 75 motion hour battery life. Updates every 20' or every 10 seconds over 10 mph. Historical Playback: Up to 90 Days - Everywhere its been! Not Contracts - Service is billed Month to Month! Easy to use! Simply charge the battery and track via the web. Watch the PT move across your screen LIVE! See the direction it is traveling, current speed, and battery life remaining right from our control panel. Example 1: A vehicle that drives for 1 hour per day of actual drive time, battery will last 75 days, before needing to be recharged. To Calculate how many days it will last for you. 2. Divide the Hours Driven Per Day by 75. 3. This gives you the # of days, before needing to recharge. 3 hrs driving per day/75 hr rated battery = 25 days of driving on a single charge. 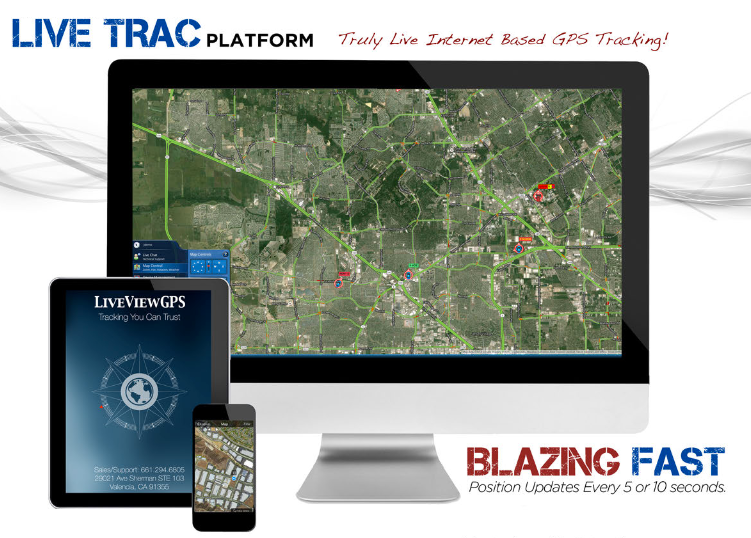 The PT-10 series GPS trackers from LiveViewGPS are powered on the Live Trac Platform. 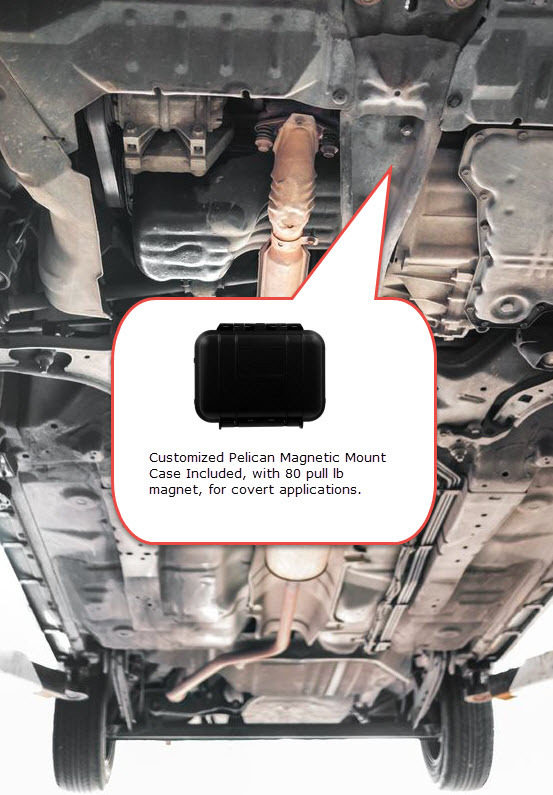 PT-10 monthly charge is a flat rate $39.95 per month USD, for both US and International use. Where The PT-10 Works: United States including AK, HI & Puerto Rico. South America, Canada and 180+ International Countries. When you activate your PT-10, you are pro-rated at $1.33 per day for the first month. On the first of each month, you are billed. November 28, 2017 by Indrek E.
We have installed the PT10 Pro in both downward and sideways orientated applications. It works in both positions equally well. The extended battery pack life is shorter in a cold climate but the device manager keeps us informed as to the battery level. 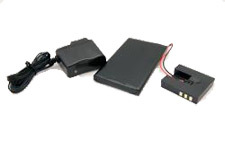 Battery packs can be changed out before total drain occurs. August 31, 2016 by Marc R.
Love this unit. This is my second device and I have the extended battery and the pelican case. The first day I used it I had instant results. I would recommend their products to anyone who has a need. October 17, 2015 by Marcus L.
Works as described. Put it on the inside of the rear bumper of son's truck, and he never knew it was there. Historical playback is outstanding feature to tell where he has been and how long he was there. Had it on the truck for about 2.5 weeks battery still at 75%. July 15, 2015 by Marc B. The pt-10 pro works great and the battery life is very good with the added battery pack (highly recommend getting the battery pack). Mapping system also very good and easy to use. Price of unit is a little high, but the monthly fee for tracking is reasonable. June 28, 2015 by CATHERINE S.
It works very well. Customer service is excellent! Thank you. June 22, 2015 by Roy F.
We just got our new trackers in. We haven't had a chance to deploy them yet, but we're very happy with the easy account set up process. The customer service was excellent as well. We had a representative take us through the website over a conference call, and it was very helpful. 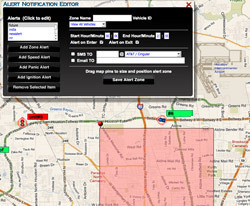 June 21, 2015 by Roy E.
June 12, 2015 by Mark G.
Product very reliable; online dashboard information-rich and easy to navigate. June 10, 2015 by Ronald E.
Hi, the product performs as advertised. No problems, works good. is very fast and detail is available if you want it. Good product. June 8, 2015 by Maureen O. The product works as advertised, is easy to utilize from various locations, and has wonderful graphics. June 5, 2015 by Janice C.
My PT-10 as worked perfectly. Customer service was awesome! June 4, 2015 by Damon T.
I am very pleased with the product i purchased and the performance..the tech support has been great..thanks! June 4, 2015 by Brian C.
The product performs exceptionally well. Battery life is what they said it would be. And their service has always been prompt, helpful and done with a smile. I give them the highest possible recommendation. June 4, 2015 by Walter A.
I have used the PT-10 for quite a while and am very satisfied. The only problem I have had is that it is sometimes slow in waking up after sitting for over an hour. 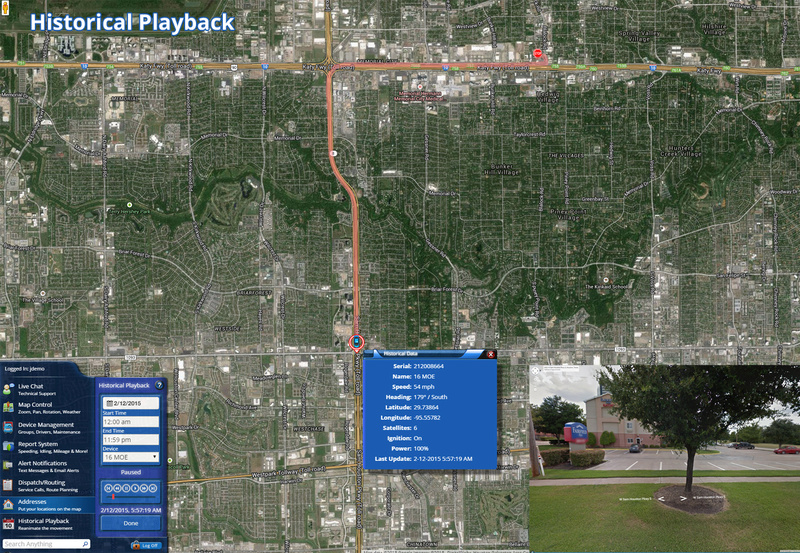 June 4, 2015 by Maria C.
Been with using LiveViewGPS 5 years. Love the service, reliable, always online. Been using two PT-10, they have worked perfectly never a problem. Would recommend, no worry. June 2, 2015 by Herb G.
I have had the PT-10 for over a year now and it has worked flawlessly. 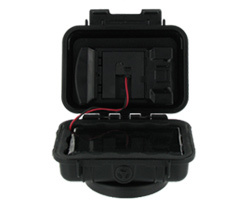 I keep it in my glove box and it picks up the GPS satellites perfectly. At first I felt that it might give better performance mounted on the visor but this proved unnecessary. I have a Ferrari 458 and it gives me great comfort that I can track its whereabouts within just feet. Thanks for that!! June 2, 2015 by Andrew F.
We have used the Live Trac PT-10 several times with successful outcomes. The tracking was easy to follow and the geo-fences are easily set up and changed. We are very pleased with the product. 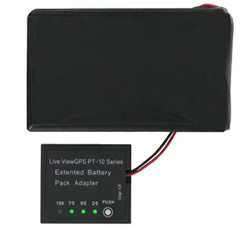 June 2, 2015 by Karen R.
I have used liveview gps for over 5 years now and I recommend them 100%. Customer service works fast to resolve any issues. The accuracy is amazing, usually within 50 feet. I use portable devices (not hardwired) so I can change to different vehicles. 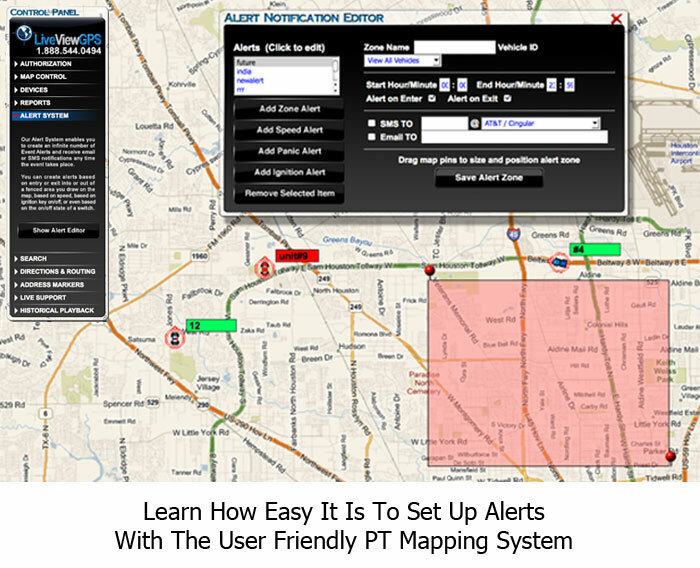 It is great for confirming times of service vehicles etc. June 2, 2015 by Tom E.
Love this device. Use it to keep track of the teenage drivers in the family without their knowledge. Not fair I realize, but when your a parrent of teens you need all the advantage you can get these days. June 2, 2015 by Rick C.
LiveView is outstanding product. We use them for law enforcement applications and have made over 20 arrest and solved many theft cases by deploying the units. 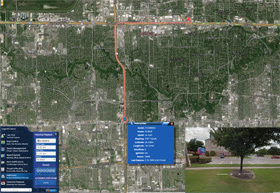 LVGPS is always reliable and the new web interfaces is great with Google Maps. December 9, 2014 by Rocky W.
It works just like they say it will!! I wasn't expecting it to keep up as fast and as accurate as they said it would, but I was able to track and follow my son from a safe distance without even being able to see his car. So I knew he couldn't see me. Also, when I was at work and couldn't watch, I could go back and see everywhere he went and what time he was there and for how long. Loved It!!! September 19, 2013 by Benjamin M.
August 9, 2013 by Gary S.
Excellent product!! As a former law enforcement officer, I currently make my living as a Private Investigator. 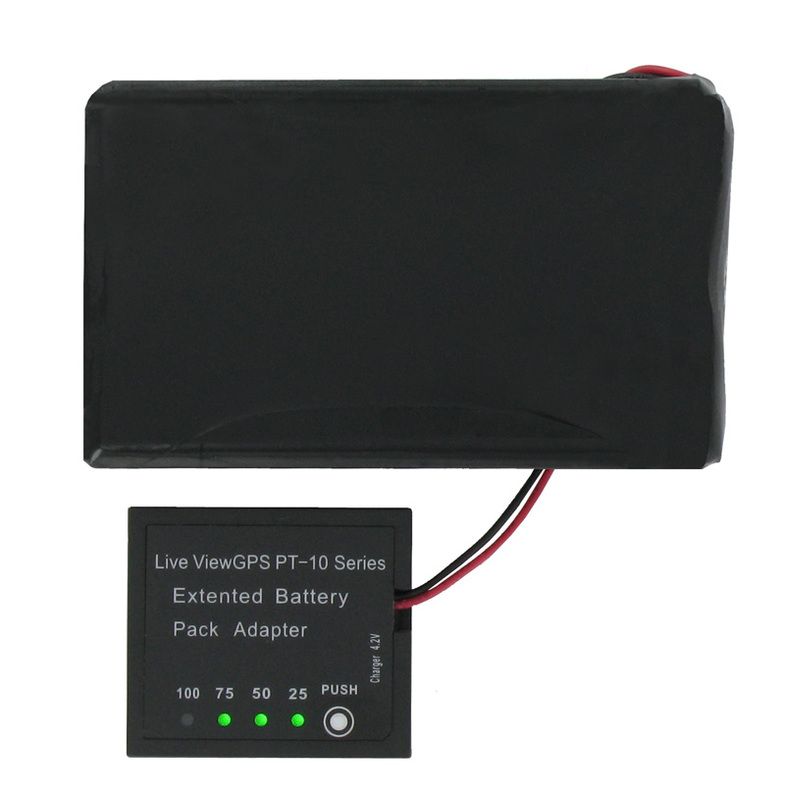 A breath of fresh air....Everything that's listed on the LiveviewGPS website about this product is true!!!! This is the only GPS unit that delivers. The PT10 Professional is just about the coolest thing I have ever seen. This provides the perfect solution, to how far our sixteen year old son can go, or how late he can stay out. It provides peace of mind for us, as we have a real time snapshot of his speed, location, and that he is going where he says he is going (we have no reason not to believe him but, as involved parents, it is important to remember Ronald Reagan's word of wisdom "trust but verify" ). We openly approached him and asked if he would rather be able to go further, stay out later, and not have to check in as much if we "chipped" MY car. Once he understood we were chipping MY car, and not him personally, he readily agreed. We have peace of mind, he has more freedom, it's a win / win situation. I like the extended battery as I haven't had to recharge it yet and it has been three weeks and is currently holding a 73% charge. I love this unit and would absolutely recommend it to anybody without hesitation. I'm a stickler when it comes to products doing what they advertise and this thing DELIVERS! Worth every penny for whatever your using it for! I tried other tracking devices but they pale in comparison to the P-10. It really delivers on the 10sec(20ft) updates and is very accurate. 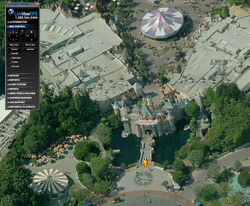 I love LiveViewGPS, the real time tracking either in map view,hybrid, satellite or Bird's eye view is fantastic. The reports definitely set this apart from the rest. I'm an engineer so it's tough to impress me but the P-10 just works, doesn't get any better than that. August 18, 2009 by Chris T.
We got this to keep track of our 1st grader as he is now riding the bus on his own. A couple times of getting on the wrong bus and us waiting in the heat for the bus to show up prompted us to research GPS devices. Be careful what you get for your money with others. Many companies don't give you such ease-of-use and 10sec(20ft) updates.. but more like 2-5 minutes. That is just not real-time tracking to me. This P-10 gives you everything you could want including responsive customer service. It was simple to set up and works like a charm. I am very critical when it comes to expensive products, so my endorsement of this means a lot. I am extremely impressed on all levels. "Under promise and over deliver" fits the PT-10 and LiveViewGPS. 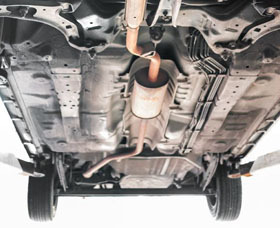 I tried to find a place on the vehicle where the unit would not perform...in the trunk, way up inside metal panels, under the hood...short of wrapping this in lead, it works everywhere! We even tracked it as it shipped in semi trucks to and from the airport for delivery. No set up, no configuration with cell service providers, no initialization codes. Simply connect the battery, slap it on and track. 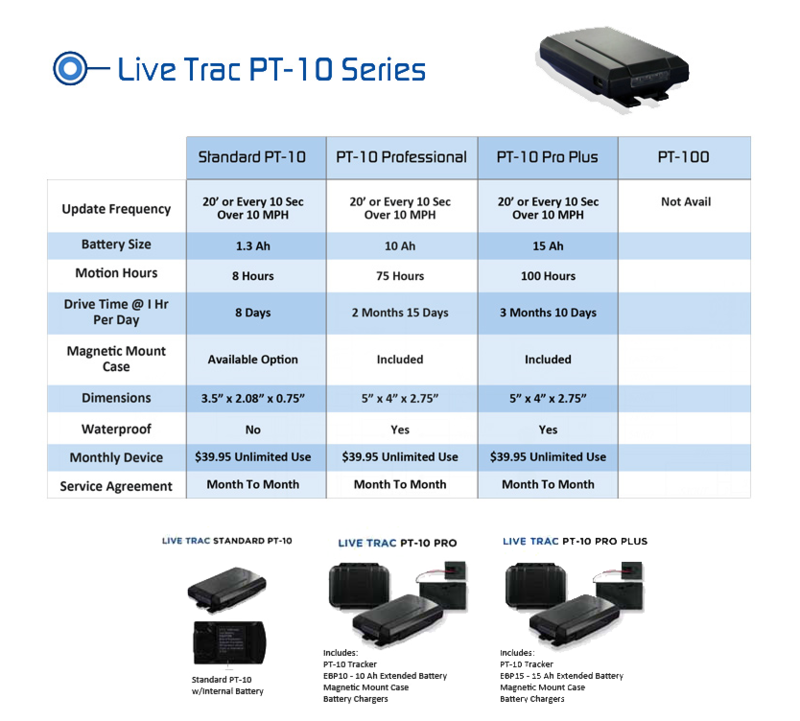 I have extensive experience with trackers costing over $5000, and this unit compares. I scored it very good as opposed to excellent for one reason...reports. They are workable, but need a little tweaking...and LiveViewGPS is on that, too. Great company, great product, great price...what else is there? 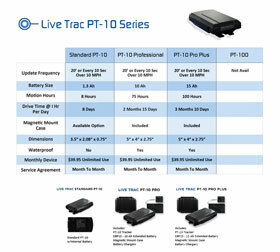 Have A Question About "LiveTrac PT10 Professional" ?